Pretty, no? This yummy merino roving is from handpaintedyarn.com, the good people whose creation of Malabrigo has already ensured them a place in the Heavenly Kingdom. I don’t think it’s carded quite as well as it could be – there are some gnarly little tiny rat’s nests that are hard to tease out, and some sections draft out beautifully while others want to snag or break apart. But I’m sure most of it is just my own inexperience, and over all I’m really enjoying it. I think I’m improving in terms of consistency, but I still hit frustrating sections where I can’t seem to spin evenly or the single keeps breaking. I’m pretty sure I’m still overspinning, but I don’t know how to solve this and also keep the yarn strong enough not to pull apart when I get to spindling a long length of it. How far down should I let the spindle dangle before I wind up the new yarn? I should probably find a class to take so I can figure out what the heck I ought to be doing, eh? So far I’m 6 for 6 getting up to watch the Tour, although I did miss one day of spinning when I brought all the fiber over to the new place but ended up staying one more night with Mr. Garter’s parents. Don’t worry – I’ll spin on a rest day to make it up. The 4th was our first in the new house. And it was quite a surprise. Our neighborhood looks pretty sleepy and demure, the kind of place where people spend more time gardening than hitting the bars, where children and chickens and cats hang out in the street and no one worries about them. But things get a little spicier for Independence Day: everyone was out in the road lighting off firecrackers, many of them quite a bit more impressive than you’re allowed to buy in Oregon. And our neighbor, a kind and placid-seeming mother of three, threw a raging party with big-league fireworks that shook our house until nearly midnight. Poor Mingus endured the explosions pretty bravely, but lost it when they broke out the screaming, crackling variety. The little guy thinks we’ve transferred him to the mouth of Hell. He likes the window seats, though. Next up: I’ve got a finished Pomatomus sock to show you! And my mother’s finally coming to collect her birthday Conwys, so I’ve got to block and photograph them. I’ve been working and moving too hard these past few days to knit much, but I’m making progress on the Viennese Shrug. Only one sleeve to go. I’m glad you’re all moved in. What a way to celebrate the 4th. Enjoy the house and may you have many happy memories there. Its funny that you said that about the 4th being LOUD, because the weekend of the 4th, while we were sweating and sifting through boxes our neighbors on 3 sides were all having RAGERS, complete with tiki torches, in-the-street beer pong and cops! Our neighborhood is super quiet normally! what a fun time to be in your new neighborhood! you must be so happy to have your new place 🙂 that roving looks just lovely. you should definitely take a class! 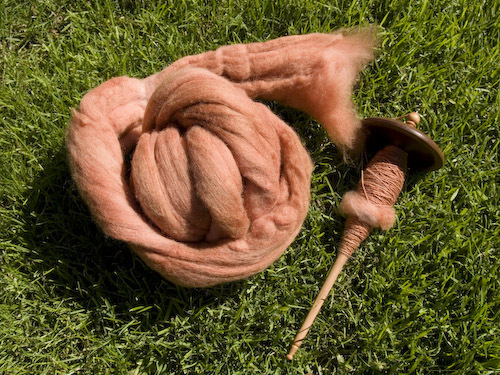 it would be a great way to meet new people in portland that you can spin and knit with. I hope your move went smoothly! V and I moved this weekend too! Have fun getting settled in and enjoy the Tour! Can’t wait to see how your spinning turns out. Midnight? You’re lucky – my neighbors were shooting off very loud (illegal) fireworks until 4 in the morning! You’re spinning looks pretty even from here. Is that a Kundert spindle? I have one of those, too. I’ve been spinning for about 4 weeks, but haven’t taken a class yet. I usually let the spindle get down almost to the floor, with me standing up. I’m sure there are people out there with more experience who will pipe up. Congrats on the move! Are you happy about the neighbors and the partying? I’m sure it’s probably just holiday fesitivities and not regular rages. At least you know that you can play music without any complaints! 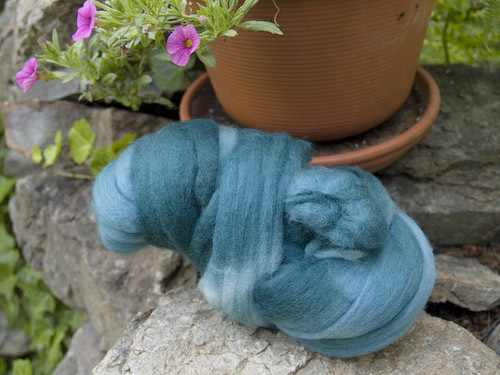 The roving is really pretty, I love the blue! I remember when I first started spindling, how I had all these questions, and after doing it for about a year now so much of it just “came” to me. 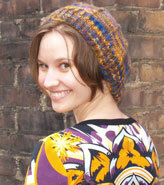 I STILL have tons of questions but am getting to a place where I really love my spindle spun yarn. I think classes are great if you can find them, but I just did lots of reading and LOTS of spindling. It *only* took me about a year to figure out how to do the long draw with my spindle, and that only after I’d figured out how to do it on a wheel 🙂 (I started spinning on a wheel after I learned to spindle). Playing with different spindles helps you figure out some of the finer points…I didn’t really get anywhere until I experimented on more spindles. Really enjoy reading your blog! You’re on the Spindlers Yahoo list, aren’t you?